It's well known in scientific circles that simply petting dogs and cats can lower someone's blood pressure. It also works with goats, donkeys, horses, mules, and water buffalo and we have them all waiting and ready. All of our four-legged friends are picked and trained for their friendliness and kindness, including the pack of about 14 dogs that roam the farm. Most of the year we have at least a few baby goats, some of the cutest creatures on this planet, to play with and cuddle. There are horses to ride here at the farm or out on the trails, all well-trained, well fed, and with well-maintained equipment including helmets and half-chaps. Our staff are also well-trained in supervising the riding and giving tips. We also offer lessons in trail riding. With all of the farm animals it isn't surprising that we do organic farming as well, and if weeding a flower bed or a tomato row is your idea of relaxation, you are welcome to do so. Otherwise we offer our produce in season at more reasonable prices than you will find in a grocery store, and it is picked from the garden under your eyes. We are experimenting with new plants all the time, and we are happy to talk to other gardeners about what is working and how. If all you want to do is lie down under a tree for a nap, that is also fine and we have some lovely lawns and olive, mango, lemon and orange trees to offer you shade. We also offer tours of the edible plants in the main house gardens, herbs and flowers that you might not have tried before. 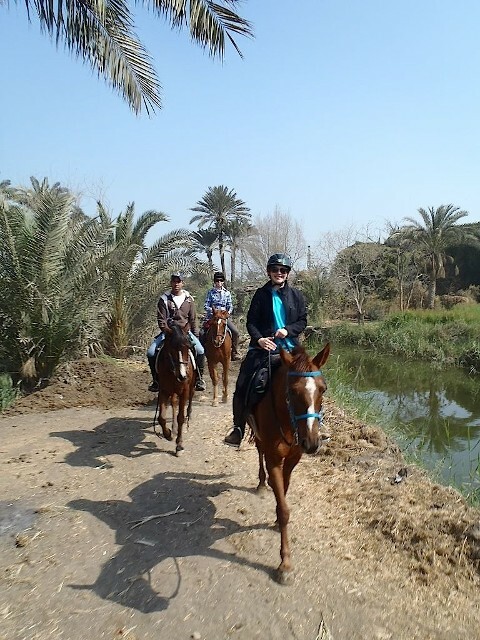 We work with most of the major international schools in Cairo offering class days at the farm where children and teachers learn about animal care, from horses to goats to dogs, and have a lot of experience in designing lesson plans for class visits. We have given the space and tools for classes in language, genetics, mathematics, botany, biology, and just general life science. But for families who visit we offer something very important, space and time for children to participate in free and imaginative play, whether chasing each other around a grassy lawn, digging in sand piles, collecting and exploring the rocks that can be found on our long sand drive, examining plants, or playing in pools that we set up on the lawn during hot weather. Visitors to Egypt often only see generic hotels, crowded streets, dusty pyramids and such, but the countryside in the Nile Valley is green and lush, growing much of the fruits and vegetables that feed the country. We can take visitors for a tour of the farm area around us on horseback or by donkey cart, expaining the ecology, social organisation, and farming techniques along the way. Egypt is a country where most of the small holdings are cultivated almost entirely by hand and using the old organic methods. While visiting, you might meet some of the local farmers who often bring animals to the farm because Al Sorat hosts the Rural Wellness Initiative, a charitable organisation that offers first aid, education, and animal maintenance procedures such as parasite control to the local farming community. For famillies who are living in apartments, visiting our animals can provide great hands on contact grooming horses, cuddling dogs who range in size from small terriers to Great Danes, and observing our chatty turkeys in the aviary. Al Sorat Farm is an educational and recreational center. 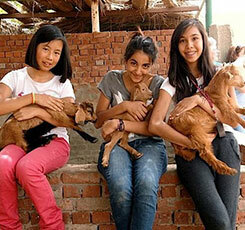 We welcome students from schools around the world to visit the rescued horses and dogs that live here. We breed goats and sheep to help improve the blood stock for local farmers, practice organic farming, offer horseback riding lessons and trail riding, and lessons in local cooking and cheese making. We also offer space for schools to conduct all sorts of outdoor lessons, from biology to language, mathematics, and genetics. There simply is no other place like Al Sorat Farm in Egypt, from the focus on natural living quarters for the animals to the interest in nutrition and the use of edible garden plants in cooking. 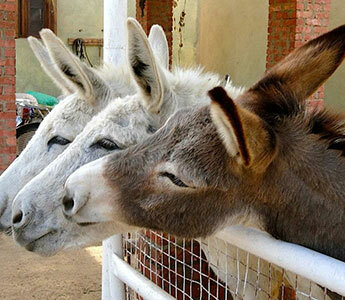 It is a place where people can perform observational studies on the social interactions of the goats or horses. We do a lot of work with charitable organizations, particularly those that benefit underprivileged children. The schools that visit the farm are private schools in the larger Cairo/Giza area. They may come out for a day visit or arrange for a week of daily visits for a more integrated program.